And Miniature Pumpkin Spice Bread loaves. First, grate your bars of soap. Then cut the tie off of your pumice stones. The next step isn't really that necessary, but I wanted to be sure there weren't any large pieces of pumice stone left, so I sifted it and then repounded the larger bits. Did you know that pumice stones are actually hardened frothy lava? Yep, that one was free! Mix the grated soap, pumice stone powder and borax. If you would like a dry mix, you can put it into your containers right now. If you prefer a more wet mix (I did) then add 1/2 cup of water. Just happened upon you blog. I think your AMAZING!!! Thanks for all the inspiration! I love how you packaged the pumpkin bread. Writing directly on the leaf is cute. First, love how you packaged the pumpkin bread...it makes them look so warm and homey. And that gardener's soap sounds like it would be perfect for anyone. I love exfoliating my hands before using lotion on them, and this seems a lot less messy than coffee grounds! 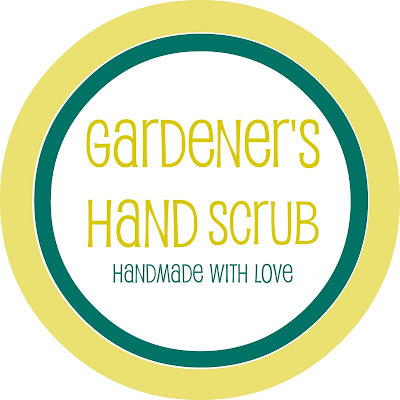 I love the idea of making a scrub for gardeners. I was wondering if you have tried adding oils (almond? oil?) to the mix to make it a little more moisturizing? I LOVE this idea because it's still more personal than, say, giving store bought bath products, but it's also appropriate for ALL the ladies that try to watch their waisteline around the holidays. THANK YOU FOR SHARING! I just love this idea; thanks so much for putting this tutorial together. I'm planning to make a batch for a gardener friend for his birthday in a couple of weeks. Would you have any suggestions of herbs to add to make it guy-friendly? Thanks again! Oh what a great idea to add herbs Sandra. What about something from your garden? I'm thinking dried basil or rosemary? Hi again Sarah, I have an update for you. It's the middle of winter here, so we've got nothing but snow in the garden, so I decided against using any herbs. My husband and I just made a batch of this Gardener's Hand Scrub, and we used Irish Spring soap, which is just perfect for this. It was really nice for us to work on a handmade project together. Love the labels, too!!! Thanks again and God bless you! Its really nice blog. Gift basket is one of the best way to express your feelings. Its really nice way to treat for your loved ones.